Have you worked your way through a series of cheap or inferior quality tents? Are you now looking to spend a little more money but on a tent that will last? Then perhaps you’re ready for a heavy duty canvas tent for camping. In principal a tent that could last a lifetime if cared for. In this guide we’ll look at the ins and outs of canvas tents and then look at some of the best canvas tents available. Why choose a canvas tent? Here are some of the main benefits of heavy duty canvas tents for camping. Cotton canvas is a more natural material to the synthetic materials some tents are made of. The biggest upside of this is that it results in a more breathable and better ventilated tent. 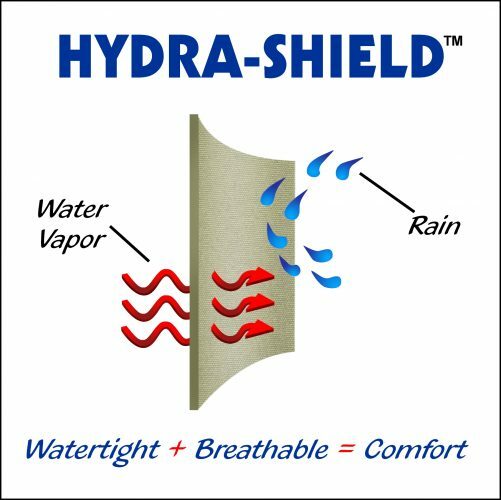 Moisture is repelled while air and water vapor is allowed to pass through the walls. This is demonstrated in the Hydra-Shield diagram from Kodiak. This means the internal space won’t get too hot on a warm day or too cold on a cool day. Furthermore condensation doesn’t build up on the inside of the tent or result in puddling on the floor as can happen in synthetic tents. Cotton fabric is inherently thicker and thus more durable to the effects of UV radiation. This will protect you the occupant. 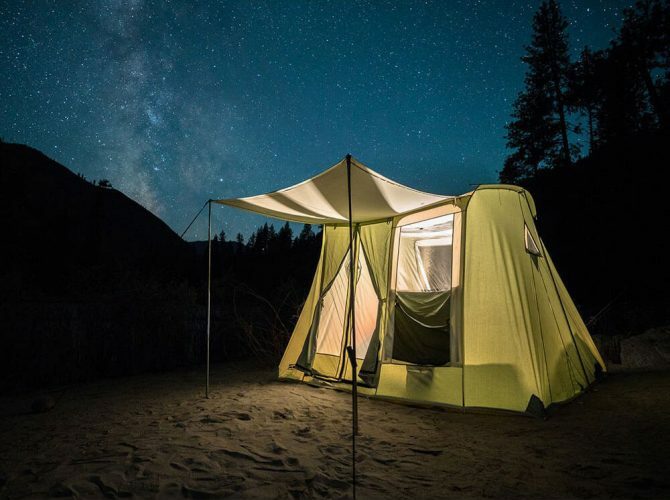 Long term you can also lightly treat your canvas tent with products like Nikwax or similar that incorporate additional UV protection. This will help protect the tent material itself. Don’t overdo this though as you’ll impact the breathable nature of the canvas. You can have the most expensive tent going but if it’s made from a synthetic material it’s going to make noise. The material will rustle as it flaps in the wind and as zippers are used. Canvas alternatives are thicker and thus offer more sound insulation. With a quieter space you might just get a better nights sleep. Before using a heavy duty canvas tent for the first time you’ll need to season it. This sounds way more complex than it actually is. Seasoning your canvas tent means that when it rains while you’re out camping you’ll be protected and your tent won’t leak. To season your camping tent set it up at home before you actually need to use it. Then either wait for it to rain or hose your tent down with a light hose spray. This will allow the cotton to expand then contract as it dries. Closing all the small holes and gaps in the material. Next time it gets wet, the water will run off. See this post for more information on seasoning and waterproofing any tent. In terms of the type of canvas tents available the majority on the market are either cabin, bell or wall tents. Their are a few dome and tunnel tents but these are the exception and not the norm. The majority of canvas tents we review for family campers are of the cabin variety. Brands like Springbar and Kodiak offer a large range with options to suit all group sizes and requirements. Cabin tents are great because they’re generally sturdy, offer accommodation that you don’t have to stoop in and incorporate all the features that families require. 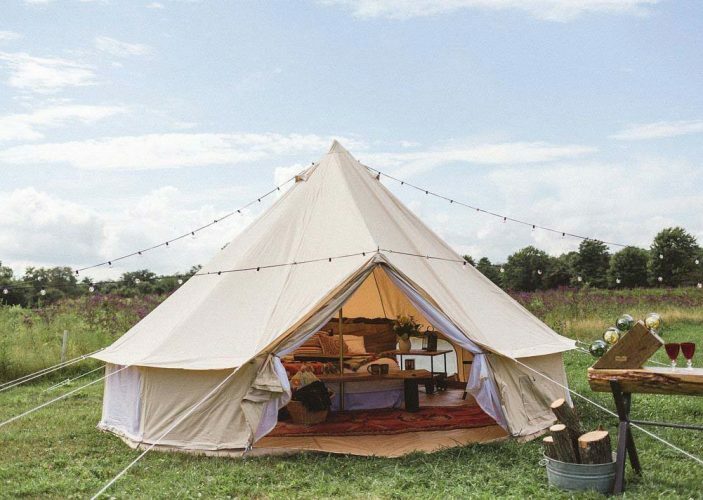 For those that are looking for lots of room a bell tent could be the answer. These are perfect for large groups or for offering luxury accommodation in. Perhaps if you’re operating a glamping type business. You can furnish with string lighting as well as a wood burner to create a special, premium space. If you’ve ever served in the armed forces you won’t be a stranger to a wall tent. Tall straight sides with a pitched roof and space to store lots of gear. These make great tents for hunters and prospectors that might be camping for weeks at a time. What types of canvas material is available? Most of the canvas tents we review are made from 100% cotton but a few a made from poly-canvas. This is a mix of polyester and cotton. The tent material for purists. 100% cotton made, a breathable tent fabric that will last decades if you look after it. The only downsides are the relative expense, the weight and the fact that it can take a while to dry out. This drying out period is essential to preserve the longevity of the tent and avoid mold growth or mildew, which can damage the fibers. The alternative to canvas is poly-cotton or poly-canvas. This is a lighter hybrid mix of cotton and polyester. It has all the benefits of cotton but is also less prone to rips and the polyester aspect means it’s more resistant to mildew. 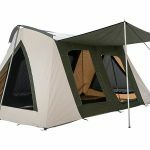 What’s the setup time compared to standard tents? A canvas tent isn’t going to go up as quickly as that pop up tent you’ve used for overnight camps. But given the weight of most canvas designs the setup is relatively painless. Those from the market leading brands like Springbar, Teton or Kodiak can even be setup by 1 person in around 10 to 15mins. See the video from Springbar below which demonstrates the process. Who are canvas tents for? Canvas tents are a heavier option than the majority of polyester or nylon tents on the market. This means they’re not going to be suitable for backpackers or anyone that’s going to venture too far from their car or truck. Canvas tents aren’t for those in a rush. If you appreciate sitting back and watching the world go by, enjoying the scenery and just taking stock then camping under canvas could be for you. You’ll also need patience and be meticulous to observe drying our periods. If you enjoy a long camp out in the wild, perhaps you’re a hunter or prospector then a canvas tent is definitely for you. Likewise those who enjoy luxury camping will appreciate the benefits of a canvas tent. It’s vital with canvas that it’s fully dried out before you put it into storage. On occasion after a wet night this might mean hanging around camp before taking your tent down. If you’re on a campground with a 10am turnaround it might not be ideal. Integrating a stove and stove pipe could help you dry the tent from the inside out. One trick when storing your tent is to store it with a battery operated dehumidifier. You can get these for $10-20 and they’ll help prevent mold growth. If you’re thrifty a homemade version is to fill a sock with talc and put this in storage with the tent. Not only will your tent smell nice but it will be completely dry and mold free. One of the main additions owners of canvas tents want to add is a stove. 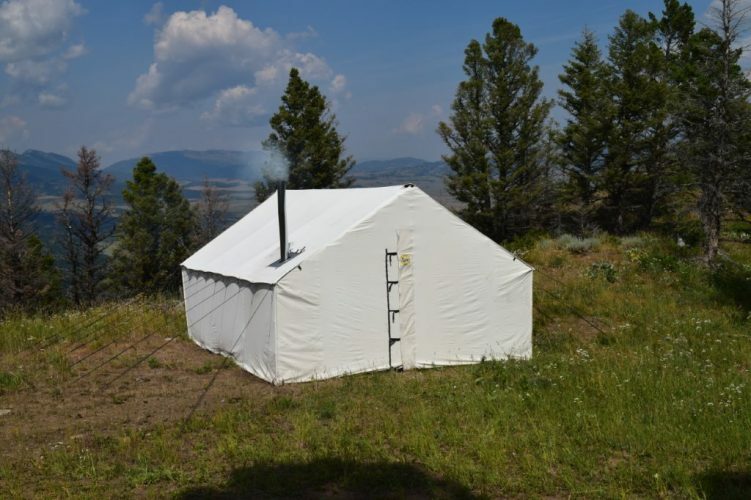 While conversion kits are available we would advise you choose a canvas tent that has already been manufactured with the stove pipe jacket in place. If it’s only heat you’re looking for then you could consider a propane powered tent heater. 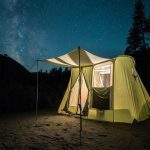 Now you’re armed with all the info you need to make an informed choice about the type of canvas tent you should purchase read about some of the best available that we’ve already reviewed below. The classic Springbar design of the 60’s was a game changer. It was waterproof, lighter than the alternatives around and roomy. It’s been copied by many and some argue that it’s been bettered by cheaper non US manufactured brands. Lets see if the Highline version of this heavy duty camping tent still has everything that made the original so good. 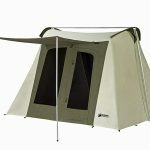 The Flex-Bow range has become synonymous with canvas tents. They’re known to have relatively quick setup times, good build quality and decent after sales support. However supporters of the home grown Springbar brand say they lack attention to detail and cut corners to get the price down. So will the 6 person model live up to the hype and prove the naysayers wrong? The lesser known White Duck brand has been quietly going about its business making great tents for families, hunters and prospectors that are perfect for camping any time of the year. This 6-8 person model is spacious and airy with lots of windows but how does it compare to the more well known brands available?